The previous night we’d eaten a fabulous meal at Radio Milano, the restaurant at our hotel in Houston’s CityCentre district, the Hotel Sorella. 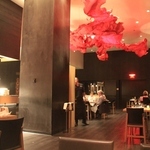 The chef, Jose Hernandez, is a Houston culinary genius, so we went for his tasting menu. One of the starters was, surprisingly, a Black Forest Gateau which, when you bit into it, revealed a totally unexpected center of squishy foie gras. So the thought of either fried chicken or donuts didn’t exactly appeal. Little did I know that half an hour later I’d be eating fried chicken in a donut… and calling for more. The queue at Lee’s on a Sunday morning was out the door, but luckily most people were taking away so we settled into a booth. Omelettes were not on the menu. There was fried chicken. There were donuts. There were fried chicken donuts. 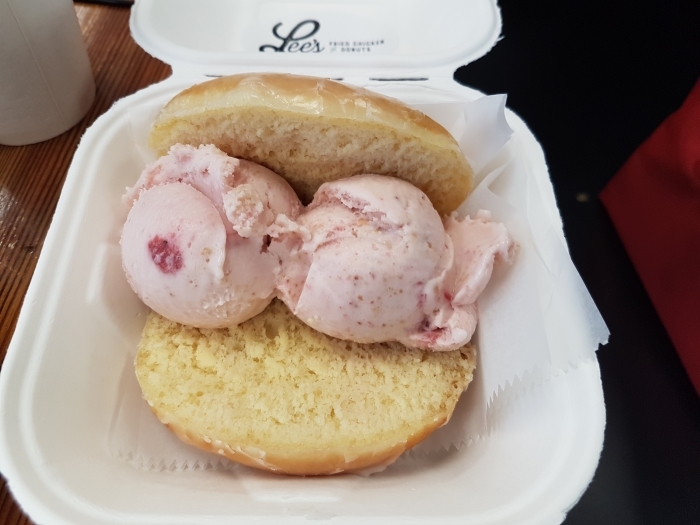 There was even ice cream donuts. There was a bacon praline donut. 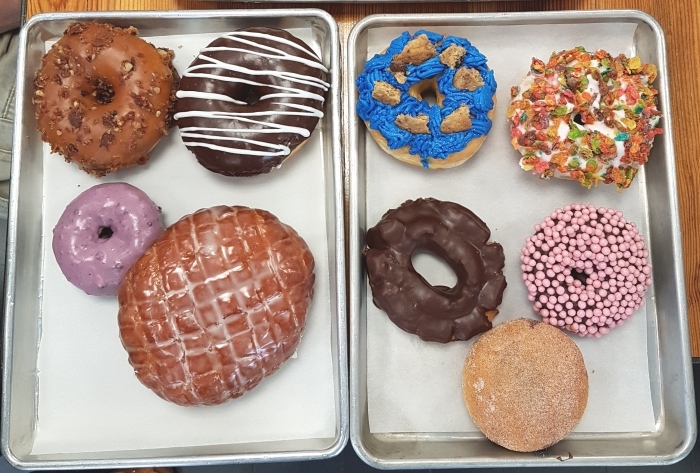 There was an apple fritter donut, and a Mexican chocolate donut with cinnamon. My resistance to donuts was disappearing fast, faced with so many tasty-sounding choices. We asked the waitress for help, which she was able to give as we discovered that she also happened to be the owner. That seemed a good idea and she returned a few minutes later with a tray filled with colourful donuts, some with equally colourful names. Bacon jam? What the hell is bacon jam? 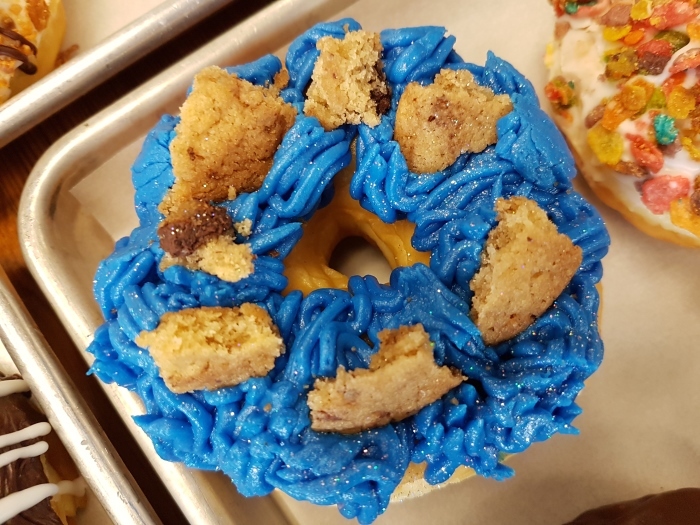 We immediately forgot which donut was which, apart from the fried chicken which bulged its way out of the donut surrounding it as if trying to dip itself in the bacon jam. It was their special, it was huge, so I started with that one in case there wasn’t room later. If I got through half of my half of the donuts it would be a miracle. I dipped it into the bacon jam and took a wary bite of the fried chicken donut. The chicken actually tasted of chicken, and the batter was equally light, as was the donut, and the savoury bacon jam tasted like… well, like a marmalade with a hint of bacon. In a strange way it was like the gourmet dish the night before where biting into what looked like a Black Forest Gateau produced a taste sensation. What seemed to be a fatty heart attack fast food snack turned out to be a combination of flavours that your palate thanked you for and then asked for more. So we gave it more, and as we wiped the last smudge of chocolate strawberry donut from our lips, the waitress reappeared with another tray. By now our stomachs were begging us to stop, but when faced with good food, and generous hospitality from people who love what they’re doing, how can you refuse? 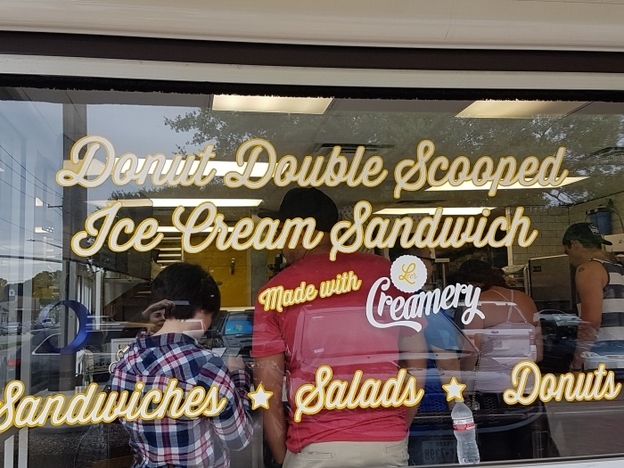 The ice-creams in a donut sounded every bit as bad but tasted every bit as good as fried chicken in a donut. The chef, Alissa Dole, came out to say hello, just like a chef in a fine dining restaurant might do. She was surprisingly young and surprisingly trim. If I cooked food like this every day I’d have a belly like Buddha. Mango and sardines in a donut sounded even more bizarre than fried chicken in a donut. I’d been told that Houston has more than 10,000 restaurants, and that Houstonians dine out more times per week than residents of any other city in the USA. I’m not surprised. 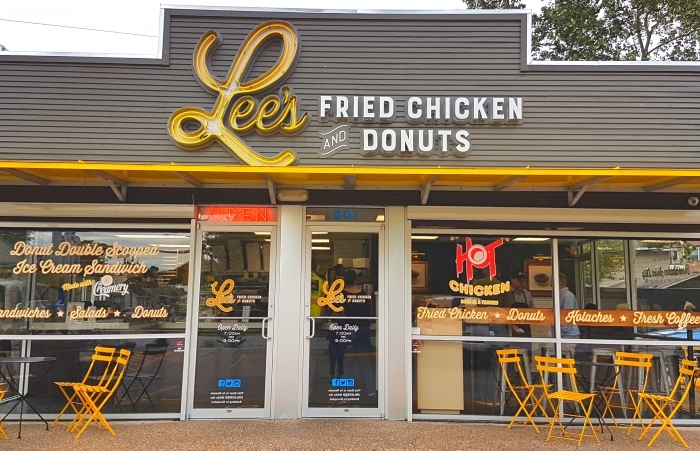 With places like Radio Milano for a gourmet dinner and humble diners like Lee’s Fried Chicken and Donuts serving the fast food equivalent of fine dining, if I lived there I’d never eat at home. And if you’ve never had fried chicken stuffed in a donut and dipped in bacon jam then, believe me, you haven’t lived. For information on Houston go to Visit Houston. There are direct flights from London Heathrow to Houston on British Airways. 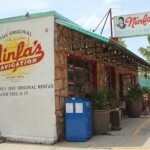 Fly-drive holidays in Texas are available through Trailfinders.